Given that the people who can repair these machines are not abundant. 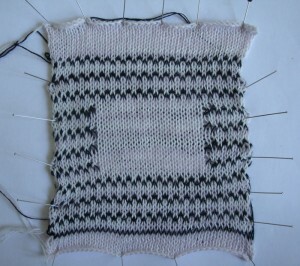 Given the fact that knitting on this machine is and will remain very manually orientated (see point 2). 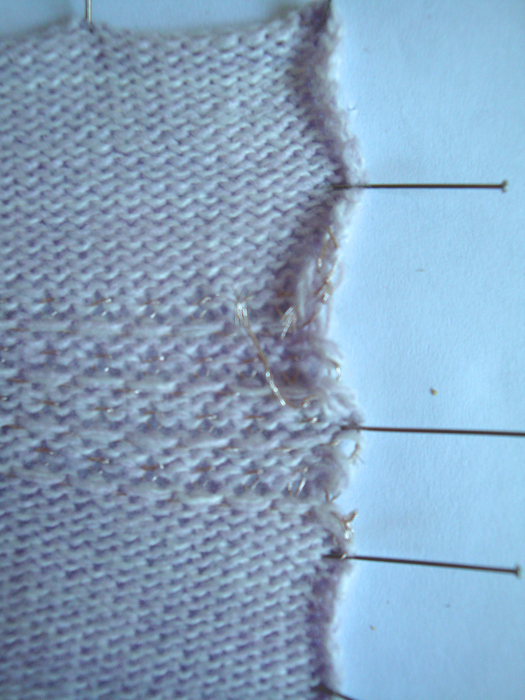 Will KH-940 knitting (or similar machines) soon be “dead”? 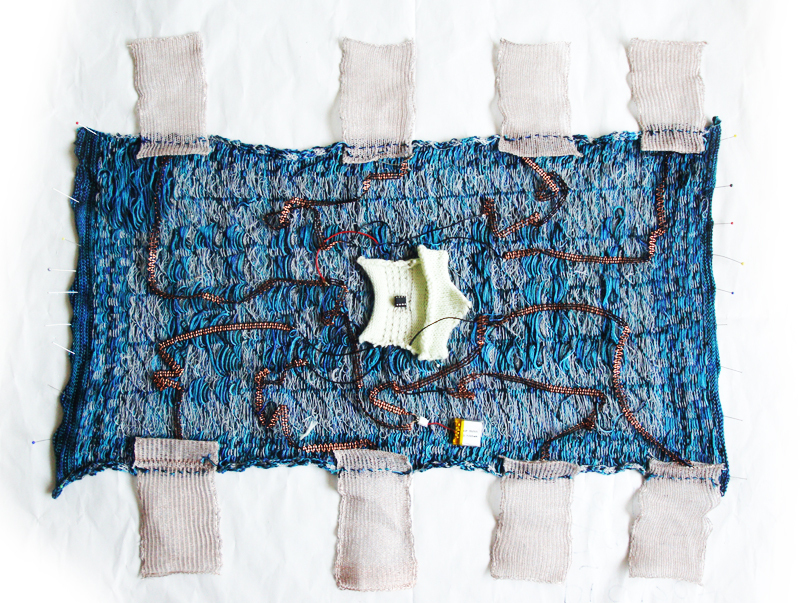 This way of knitting will never be comparable to 3D printing – push the button like action – . Is this an advantage or a disadvantage? 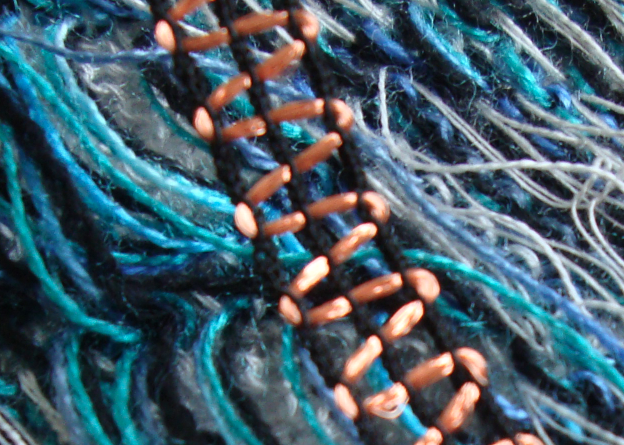 Some participants suggested inventing 3D printing like knitting machines. Documenting knitting is not easy, given all the manual actions required. Will there be a standard? 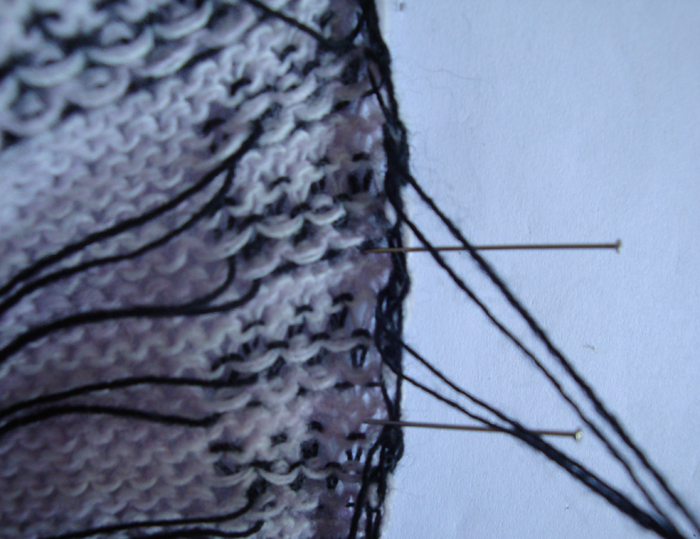 Probably not, since documenting is taking even more time than the knitting itself. 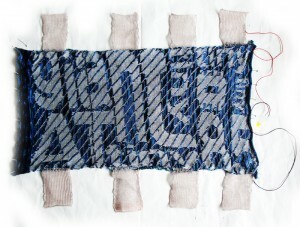 Documenting is further hindered on a general level by all the different fabrics, threads, sizes etc. There are a lot of Youtube movies tutorials by people from a totally different community: dedicated knitters. 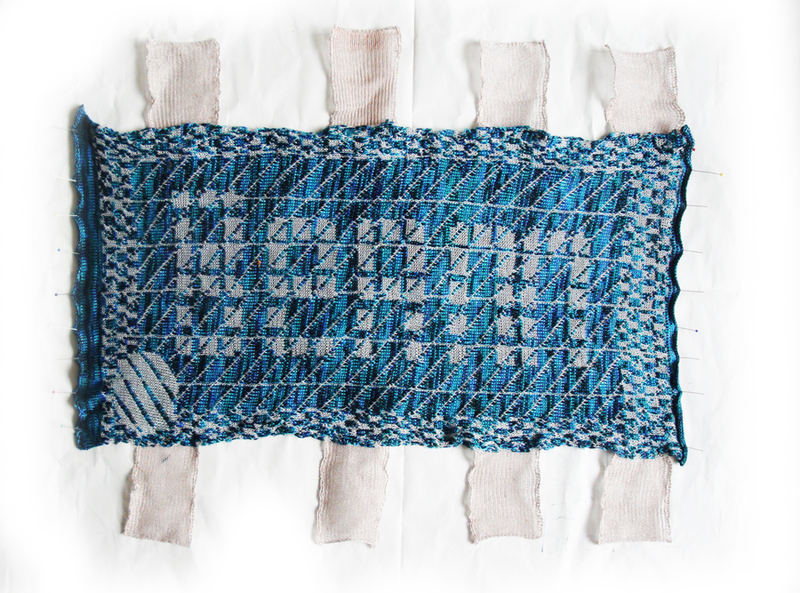 Can there be a knowledge exchange or is the mind set of the digital age and the knitters too different? 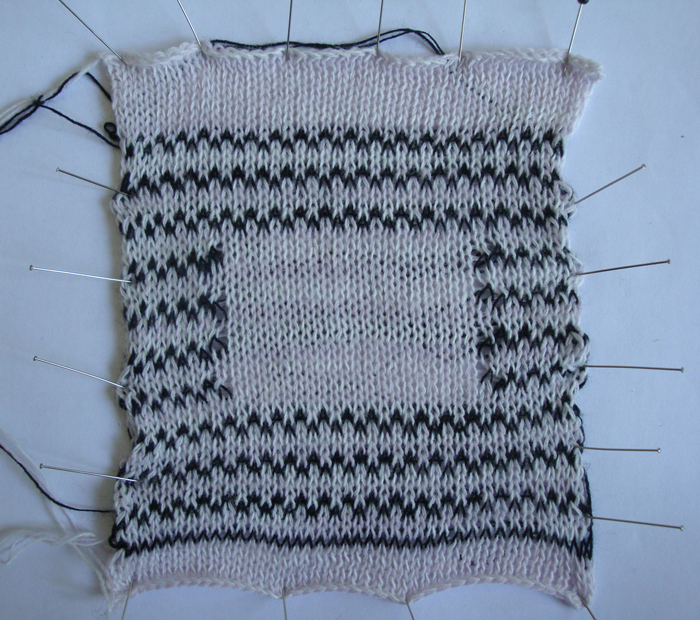 Why is this knitting machine so attractive? 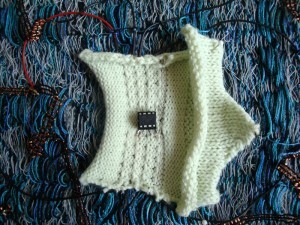 It seems to be a digital machine, because you can transfer a digital image (circuit) and knit it. it can be hacked, this word alone means “fame”, nowadays. 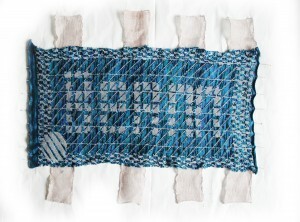 by knitting, your own fabric can be made, this means DIY, another word attracting immediate fame. it is 30 years old, and it still works! 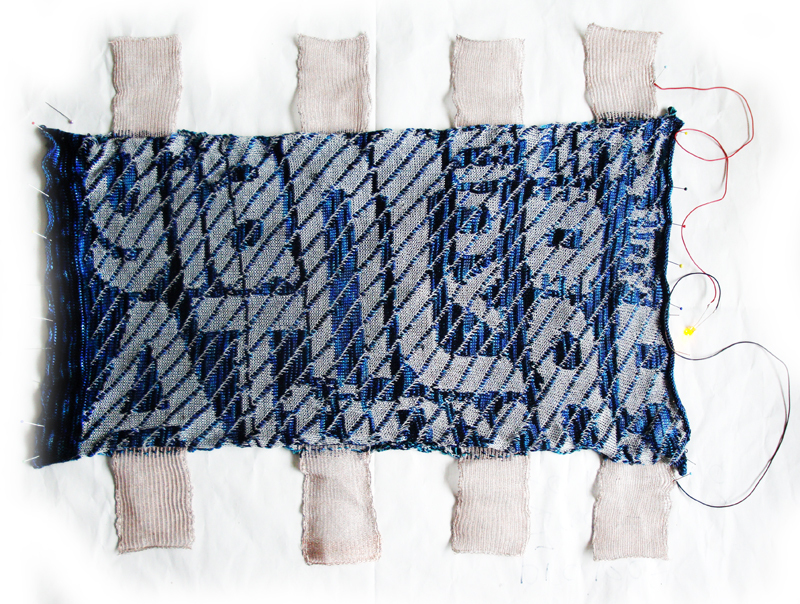 amazing complexity, what an attention is given to all the details, little hooks, ways to fold it into the box…. An image is an alternation in threads. Normally you can use 2 threads. 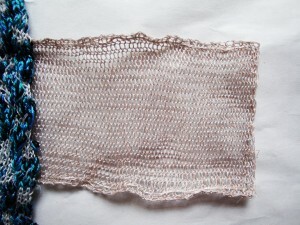 Alternating a normal yarn with a conductive yarn makes the knitting e-textile. (Besides these methods: Designaknit using the Brother USB-TTL cable) – costs money. 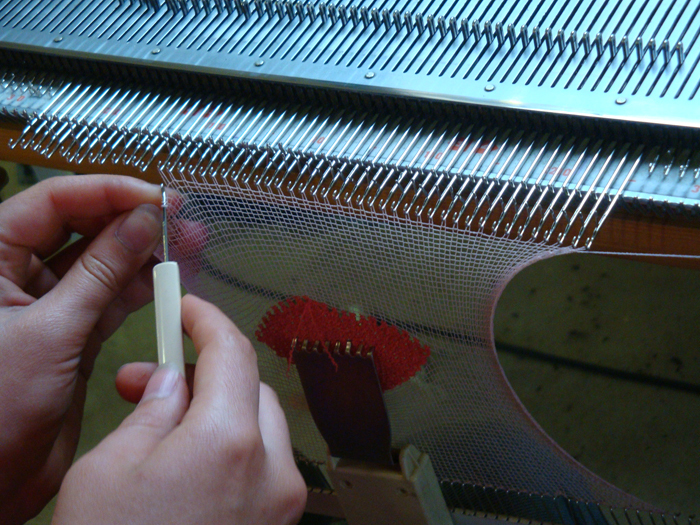 Old knittic board which seems to be slowly dying, meaning: it transfers the image 1 in ten times trying, the solenoids don’t react in 9 out of 10 tries. Sometimes it helped changing the USB cable, or fiddling the wires, but no pattern of definitive bug is detected (yet). company: Karl Grimm, was used, to solder. 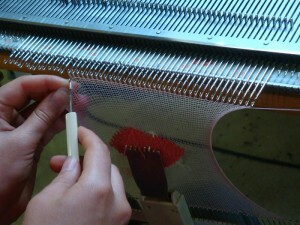 The way to attach this swatch, or make it attachable was explored using magnets. Here in a knitted pocket, in the point, a magnet ring is inserted. 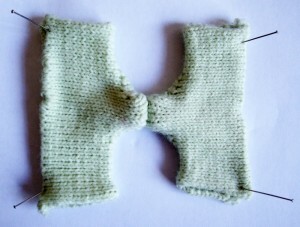 The knitted pocket technique with more strong magnets together with tight knitting provides a convenient way for attaching pieces of knitting. 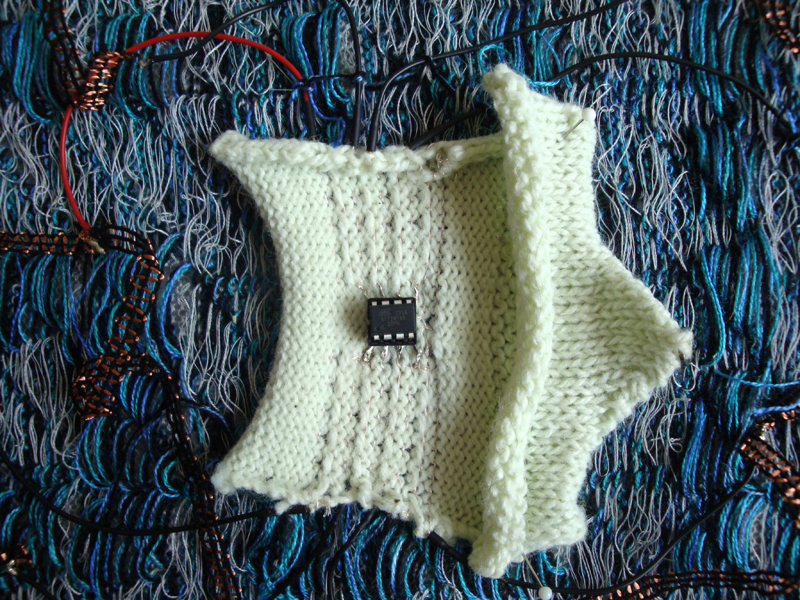 The knitted fitting of the tiny ATtiny85 asked for a contrast: a giant ATtiny – knitted. It is the purpose to make this into a wearable. 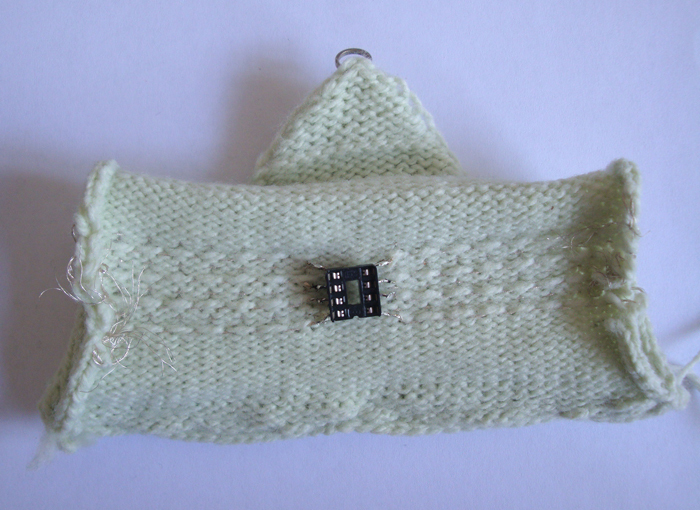 inside of the back side: the ATtiny is mounted on the knitted support, the PIN’s are connected using the elastic wire ( Conductive Fabric Tape company : Amohr), which corresponds to the stretchyness of the knitted surface. 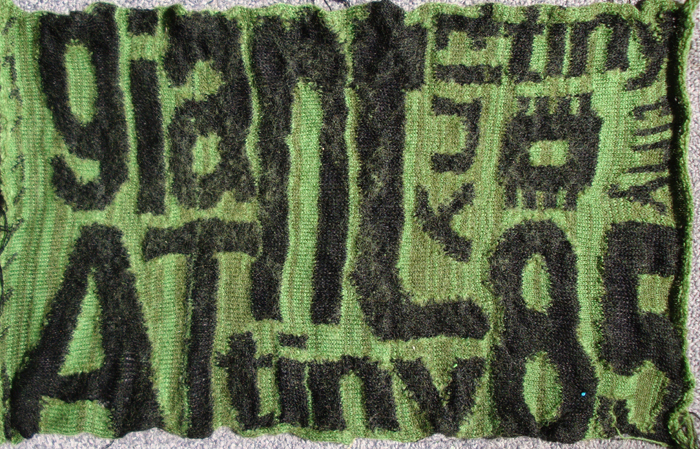 The knitted top side with the “giant ATTiny85″ text image. 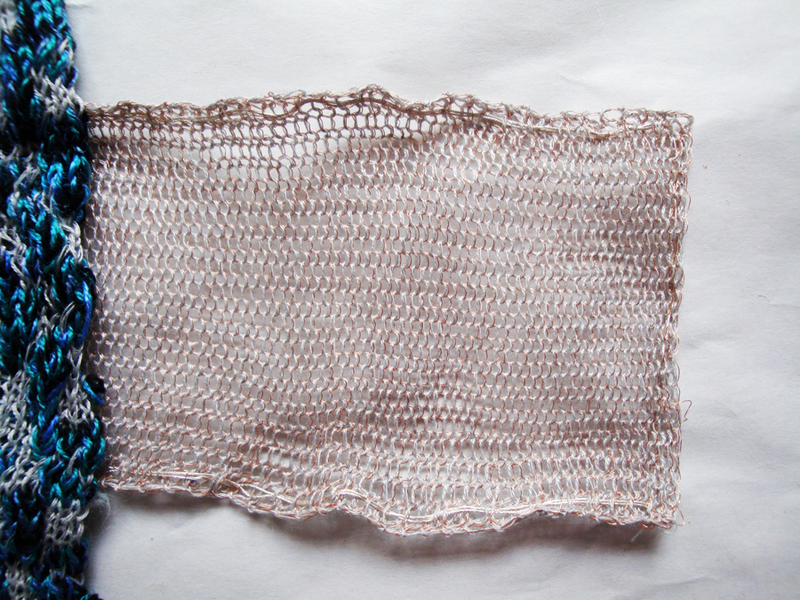 The grey area is conductive yarn ( (Bekinox Nm50/1 cotton Company: Bekaert, Characteristics: Resistive, Very thin yarn, 2 ply,). This makes it a perfect surface for touch or static electricity probing. The elastic copper wire, coated so it does not make a short cut. 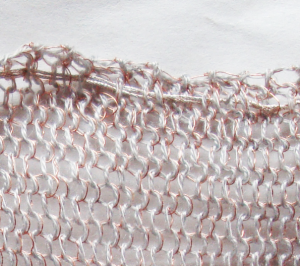 The big PIN’s are another micro exploration: stiffness is attained using copper wire with conductive yarn (Bekinox Nm50/1 cotton Company: Bekaert, Characteristics: Resistive, Very thin yarn, 2 ply,). This copper wire is insulated so it only contributes to the stiffness. company: Karl Grimm) provides a nice connection. 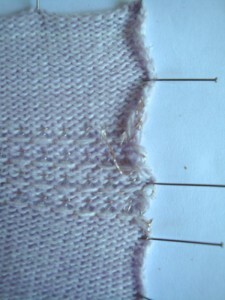 A different knitting technique avoiding the loose horizontal wires. 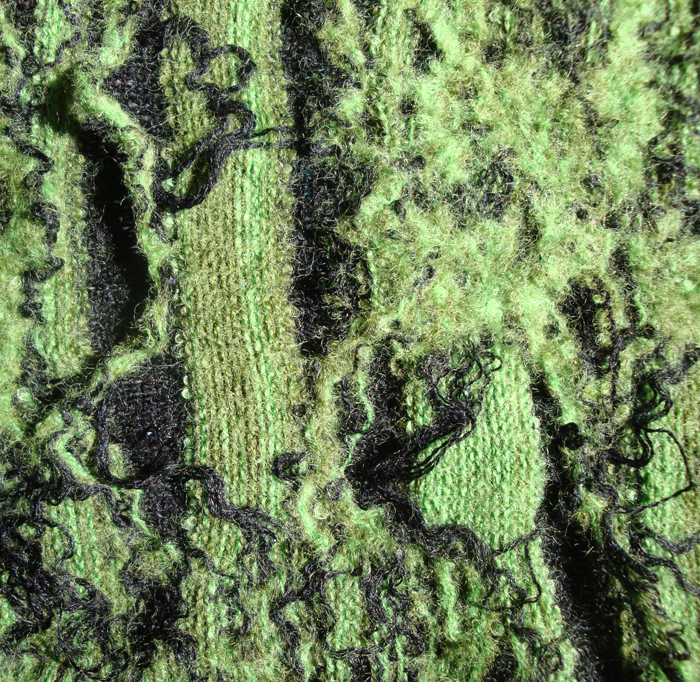 The felting wool provided by Yeoman was extensively tested. 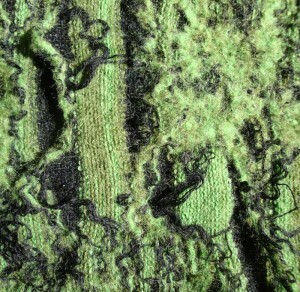 The loose threads caused by Nordic knitting are felted into the fabric. 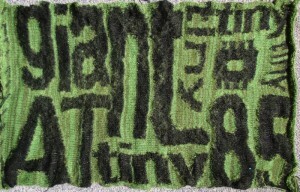 With images the colors have a slight tendancy of felting into the other color, as can be seen above, the green is also felting into the black. 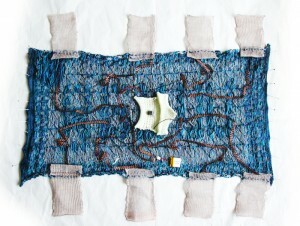 Using conductive wool and image knitting an interface is created for VJ.